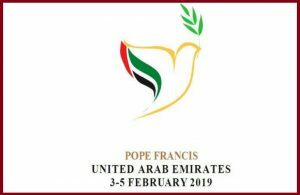 The Holy Father’s recent visit to the United Arab Emirates, which was the first by any Pope has drawn a lot of attention from people across the world. It was much anticipated and the world was eagerly waiting to hear what the Holy Father would say, or would not say. True to his nature and character of being honest, modest, humble and direct, the Pope approached the various issues with clarity, conviction and forthrightness. Standing in the heart of the Arab world, he spoke from his heart, without any nuances, but with much concern tempered with hope. The Holy Father was very conscious and respectful of the religiosity of the Arab world, while at the same time calling for a renewed reflection on the lived aspect of faith. His visit to the United Arab Emirates was to reinforce the spirit of fraternity, to give a clarion call to respect diversity, to foster dialogue, to condemn violence in the name of religion and to give a call to embrace persons denied of basic privileges.